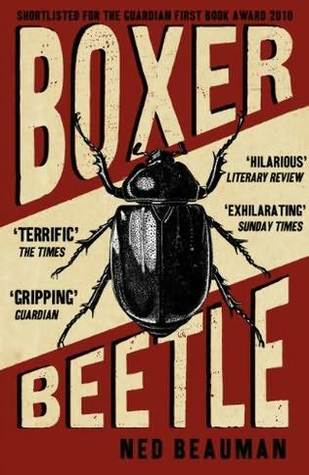 Boxer, Beetle is a novel taking place in two different times: the present day, and the mid 1930s. In the present day, our first person narrator is a Nazi memorablia collector and odd jobs man for a much richer collector. He's suffering from a genetic condition that makes him smell bad, so he lives most of his life on the internet, except, very little of that is in the novel: we join him as he finds himself tasked with resolving a mystery. Soon, dead bodies are piling up. Meanwhile, the mystery is all about a short, young Jewish boxer and a scientist passionate about eugenics in the 1930s. This plotline follows the career and ups and downs of the boxer, and the British scientist who wants to use the boxer for experiments. Until he can achieve this aim, he has to contend himself with working on beetles. The book is pleasantly entertaining, fast-paced and quite readable. It does occasionally allow itself a whopper of purple prose or two, though. Could there ever be a dafter sentence to start a chapter with than "The morning light peeked in through the windows of the mortuary, pasty and trembling like the sort of ghoulish little boy who would rather see a dead girl than a naked one" ? The plot gets a little crazy, especially towards the end, when all the carefully built up attempts at authenticity go out of the window in favour of a finale that reeks of B-movie scifi. It's a book that wants to be a bit literary, but also pulp fiction, so we get repressed homosexuality, confident homosexuality, a murder mystery, a conspiracy theory thriller, a rise-and-fall chronicle of a boxer's career, a satire (with a lengthy, dialogue heavy conference of fascists, beset by petty personality conflicts and politicking), all in one relatively short book. It might aspire to be literary, but in the end it feels quite shallow. It reads a bit like a Quentin Tarantino movie, though more restrained in the first two thirds of its narrative. The book certainly squeezes a lot of ideas, anecdotes and themes into the novel.